Apple admitted that less than 1 percent of iPods shipped after September 12 are carrying a Windows trojan horse with the filename of RavMonE.exe. RavMonE.exe infects the target computer by means of external storage drives and the famous “autoplay” function in Windows XP. The trojan horse can spread to other external drives when attacking a PC without any user prompt or warning. Apple suggests Windows users download a free trial of Malware protection software; but a forum topic at Norman.com can help remove those infected with the virus. This is very bad press for Apple and Windows. But what many should realize is that Windows is Windows, and we all know that Windows can easily be attacked by any sort of virus or trojan horse. 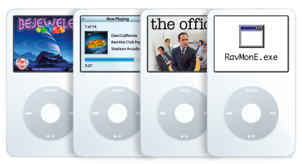 It just happened to be that some iPods were attacked by the virus and Apple should have done a better job detecting malicious software on their products before release. Another Great reason to buy an Apple Comp. You mean buy a PC and download OSX. Apple’s hardware is overrated and overpriced.